﻿ Apex Home Services Inc.
We use the lowest possible pressure to insure your roof stays healthy, and your home and propery is cleaned safely. 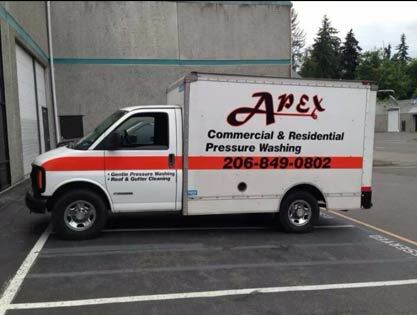 At Apex Home Services we serve Snohomish County with a focus on Lake Stevens, Marysville, and Snohomish. Give us a call today for a free estimate. We have references available upon request and have over 15 years experience taking care of homes in Snohomish and North King County. Apex has worked hard to earn the trust of the community by being friendly, honest, and hard working. We use the best available equipment in the industry, and all employees are skilled in working safely and are highly trained to use the utmost care when your cleaning your home and exterior surfaces. At Apex we can help with roof, driveway, patio, walkway, portico, deck, siding, and gutter cleaning.You can find out more about Apex Pressure Washing here. As a locally owned and operated company, (our home is in Lake Stevens) we understand the challenges of Northwest weather and the toll that can take on your home, as well as the processes and techniques we can use to prolong the life of your roof, siding, hardscapes and more. You can rest assured that we do our best to make sure that your homes value is protected now, and for years to come. Curious about some of our tips and tricks? Read more here.